A Commando Droid is a droid minifigure from the Star Wars theme. The droid first appeared in LEGO Star Wars III: The Clone Wars as a playable character, but later appears in a physical form for the first time in 9488 Elite Clone Trooper & Commando Droid Battle Pack. 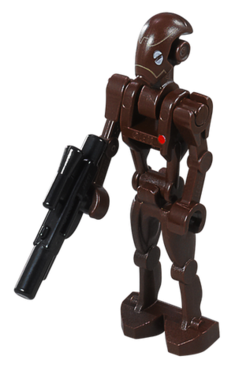 All of the parts of a Commando Droid are primarily dark brown in colour. The leg piece is of the same mould most commonly used for the legs of a Super Battle Droid, and the torso and arm pieces are usually found on Battle Droids. One of the arms is bent and with a hand parallel to the body, while the other is straight and has the hand perpendicular, so that the droid can hold a blaster. A red dot is also printed on the left-hand side of the torso for a more accurate likeness to the droids. A new mould was designed for the Commando Droid's head, which is shorter than a normal Battle Droid's head. It features a printing design on the front for the droid's photoreceptors and outlining of the different bits of plating. The Commando Droid in LEGO Star Wars III: The Clone Wars. In LEGO Star Wars III: The Clone Wars, Commando Droids are found as enemies on various levels and bear a likeness to their physical variant except they are black, with some areas of brown on their body. A Commando Droid is also able to be used as a playable character in Free Play. It is armed with a blaster pistol, and has the ability to jump and grapple. As enemies, some of the Commando Droids use vibroswords instead of blasters. BX-series droid commandos were developed by the Confederacy of Independent Systems to carry out stealth assignments. These droids had infiltration software installed, and were also built to be faster, stronger, and able to take more damage than an average battle droid. Droid commandos were able to effectively use several weapons and tools, including fusioncutters, stun batons, and sniper rifles. Droid commandos were deployed on the Rishi Moon in an attempt to take control of a Republic listening post so that Separatist forces could assault Kamino without being contested along the way, however they were eventually overcome by a group of clone troopers. They were also present in battles on Ryloth, Saleucami, Lola Sayu and Dathomir. This page was last edited on 10 August 2016, at 10:59.